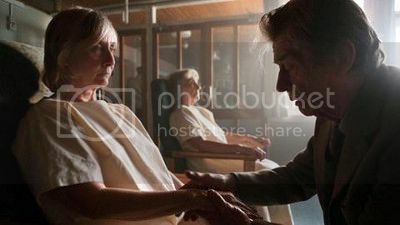 "After placing his ailing wife Alice in a care home elderly academic James Parkin goes to stay at a wintry out-of-season hotel which they used to visit together." As you can see, I couldn't find a legitimate trailer for the BBC's 2010 remake of their classic 1968 ghost story for Christmas. I also couldn't find any version other than the overpriced Michael Hordern one on Amazon to link to in the affiliate box either so I assume that this still isn't out on DVD anywhere yet. 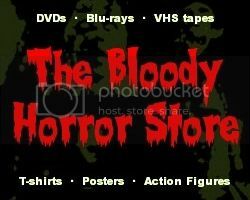 Since it was little more than a TV show rather than a movie, I don't expect it will ever be on DVD on its own anyway. I don't often do this, but due to being in America and having missed "Whistle and I'll Come to You" when it was shown on Christmas Eve two years ago, I couldn't stand it any longer and had to watch it online. I've always loved M.R. James' ghost stories and the BBC adaptations of them so missing out on what was potentially another good one had been eating at me ever since I first heard about it. Unfortunately, despite superb direction by Andy De Emmony, this more modern adaption was virtually a rewrite of M.R. James in a bad way. Although Neil Cross retained the core components of M.R. James' short story in his screenplay, he lost all of the legends and most of the mystery which made the original so good. It didn't even have a whistle in it! Watching this on my own at three o'clock in the morning with the lights off, I was still genuinely creeped out by the whole thing, but not entirely for the reasons anyone intended. Suffice it to say that during the hour when statistics say that most people die, I started thinking about a lot of things which I shouldn't. Seeing Gemma Jones (who you might know as Madam Pomfrey from the "Harry Potter" movies) playing the part of an old woman with dementia reminded me of how my grandmother ended up. The old people's home (or whatever politically correct term is in vogue now), reminded me a lot of the horrible asylum which I saw my grandmother get put in only a few months before she died. All the people sat facing each other in silence with one or two or them occasionally crying out was some kind of Hell for sure. I hope I never end up like that. Maybe it wouldn't be so bad if I also had Lesley Sharp as my carer since I've found her strangely attractive ever since I first saw her in ITV's "Afterlife" series. For those of you who are unfamiliar with it, that show also gave Andrew Lincoln from "The Walking Dead" another big career boost after his stint in "Teachers" and "This Life". I was actually quite surprised at how warm and toned-down Lesley Sharp was in "Whistle and I'll Come to You" as she couldn't act very well at all in "Afterlife". She only delivered one line during a telephone conversation badly, but even that was down to the script rather than her ability. The other notable actress in this who I racked my brain trying to place was Sophie Thompson. Although she was also in a "Harry Potter" movie, she is much more famous for playing the quite unbalanced Stella in "Eastenders". Maybe it's my age, but I thought she was very pretty from certain angles too. Her character came across as quite nice but a little bit dim which is always endearing. 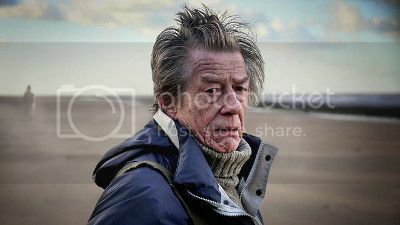 John Hurt turned in a routine performance as James Parkin, but even at his worst John Hurt always eclipses other actors who are trying their hardest. The man has always had a natural talent and charisma which transcended his looks and, of course, his voice is legendary. Having said that, I didn't really like his character all that much, and the "haunting" (whether triggered by guilt or having a far more supernatural purpose) turned him into a jelly far quicker that his scientific background should have allowed. One scene was so blatantly borrowed from "Poltergeist" that the result made him look quite childish. Given the two adaptations, I think I still prefer Michael Hordern's version of the same character. The sparseness of any incidental music, which left the soundtrack comprised of only natural sounds such as seagulls and wind effects, made "Whistle and I'll Come to You" eerier than it could have been. That silence contributed a lot to the isolated feeling and emptiness of the beach scenes in particular. I was a little bit baffled as to why they chose Kent instead of the usual Norfolk Broads for the location, but it still worked in spite of the electricity-generating windmills. I supposed that the contrast between the new and the old was there to continually highlight that John Hurt's character was coming to the end of his time just like his wife. If that was the reason, it was messily done as both the hotel and its receptionist still looked like they belonged in the 1940s Give or take a couple of clocks from the '70s and John Hurt's very modern anorak, the story might have worked a lot better as a period piece, but, apparently, nobody wanted to retread the same ground as the previous M.R. James adaptations. Anyway, "Whistle and I'll Come to You" wasn't a total disaster, but it was disappointing in its failure to stay true to the original story. I didn't expect it to be quite as short as it was either and had assumed that it was going to have the ninety-minute length of a movie rather than be a measly fifty-minute TV episode with a new ending. If you feel like tracking this down online, its still worth a watch, but you'd be better off reading the original story instead.